Let's start with one point. I saw Elvis. Yep. His voice sounded vaguely familiar to the announcer earlier in the evening at this event, but still, Elvis is Elvis! It's Memphis so why not. It was early Elvis and maybe his accent was a little unusual for a south guy, but I'm telling you, it was him for sure! Ok, enough of the historically significant sightings and on to talk about the meet a bit. 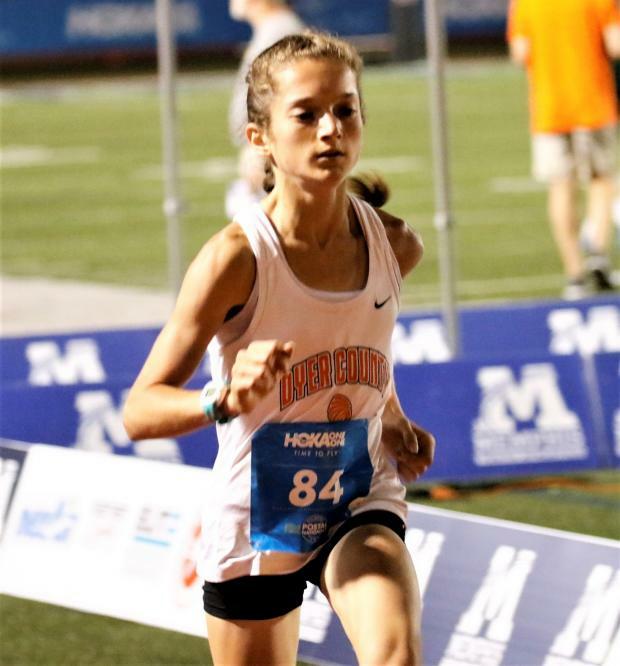 Coming into this meet as one of the favorites to take the top spot, Houston's Lydia Tankersley did exactly what she planned, finish the evening with a win! Her 11:49.61 was good enough to secure the top spot among a very talented group of athletes. During the track season last year, Lydia was the Section 4 champion for the 3200M in 11:55 and so she comes into this cross-country season on a strong note! Dyer County's Isabel Trasolini improved on her time and place from last year's HOKA to get the runner up spot in 12:13.05. More than forty second improvement this early in the season is certainly going to put her into a spotlight to get her out of the Region 7 championships and earn her spot at the State meet this year for her senior year! 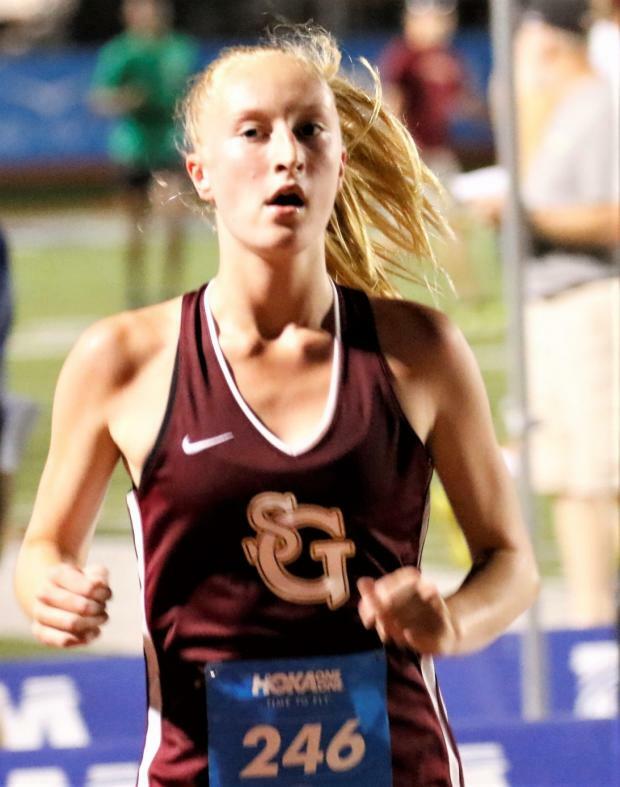 The reigning DII-A West Region champion, St. George's Allison Newman matched her position from last year's Hoka. 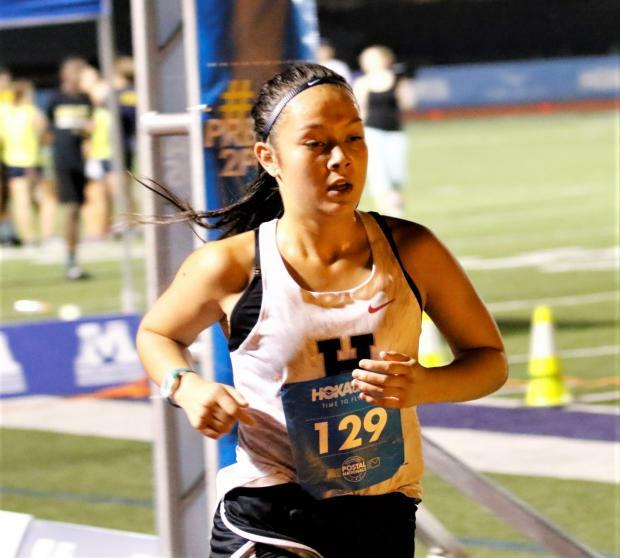 Running 12:20.50 vs 12: 32 last year was enough improvement to hold off the next couple of athletes and get her cross-country season started off on a strong note. The next couple spots weren't really decided until a couple of laps to go, and then it really could have gone any way. First Assembly's Abbie Baker and Briarcrest's Vi Stuart seemed to match their splits and counter each other's surges. Abbie was able to hold off Vi by keeping her last three splits a second or two ahead of the Briarcrest Junior. Both these girls set new PR's for the 3200M distance and so you know they were giving it their all at this early fitness test. And on that note, I'd say all these athletes passed this early season test with flying colors! 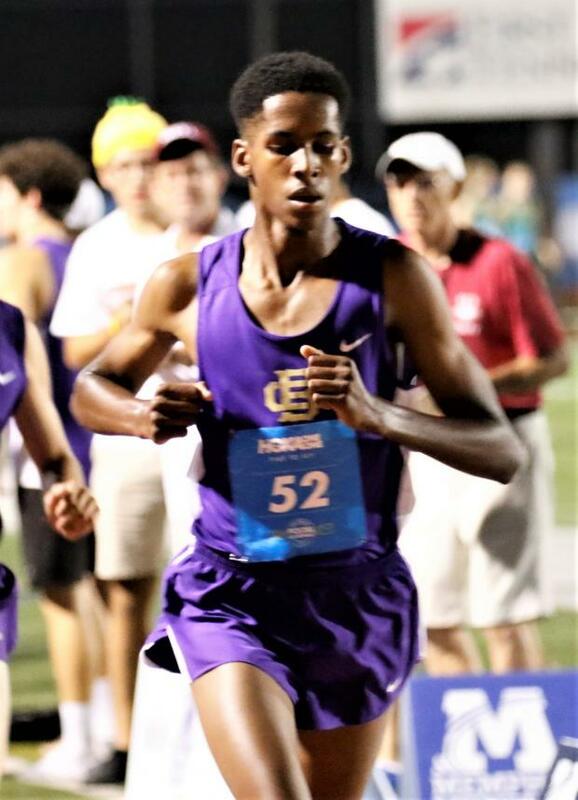 With close to 200 boys racing on the CBHS track on a hot and humid evening, it took some pretty solid performances to make the top five Saturday. The top three athletes running Saturday had to go under the ten-minute barrier to get there. Leading off this group was Houston's Bradley Turner. Bradley turned in a solid performance and posted a pretty huge PR for the distance with his 9:46.82 time. That bettered the time from last year's winner and put him solidly in front of this group of capable athletes. 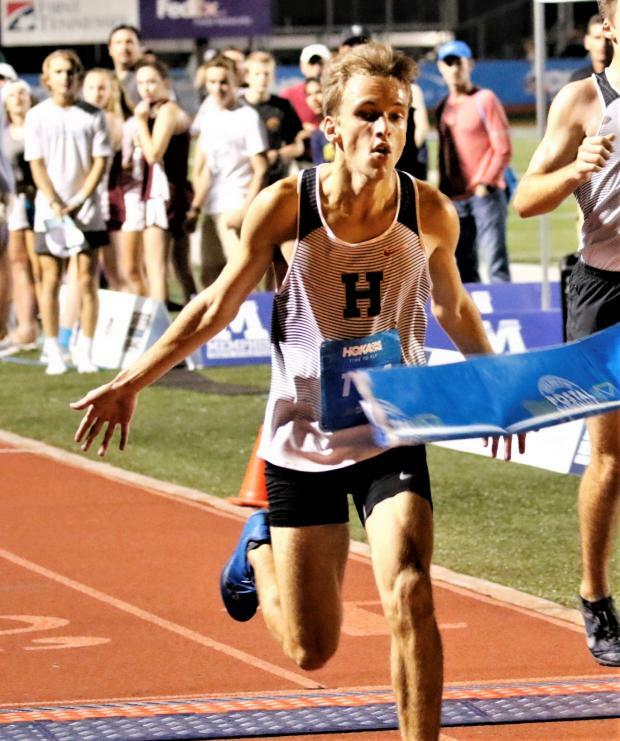 Bradley won last years Section 4 track championship in the distance with a 10:04 and is proving to be someone that should be watched this season as he approaches this cross-country season. Constatine Campbell (Christian Brothers) and Davis Rangel (Evangelical Christian) were pretty much matching their leg speed across each lap of this race. With splits in the 1:15 to 1:17 range for most of the laps, it was Constatine that had about a half second advantage on the last lap. A 1:07.8 to Davis's 1:08.1 split was the smallest of margins that it took for Constatine to get the runner up spot on his home turf. Using his 2:01 800 leg speed, Constatine posted a 9:59.37 to set a new PR for the distance. Davis posted his mark less than a second behind in 9:59.69. 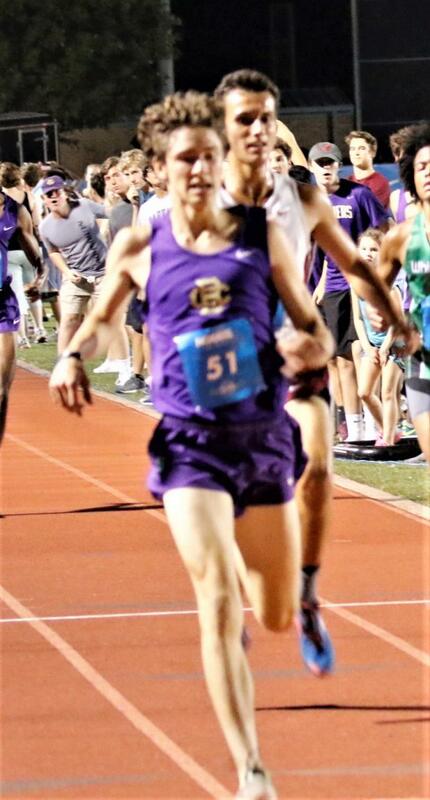 Another CBHS athlete, Tyler Casey, was right on the shoulder of this lead pack with his 10:01.39 fourth place finish. And thanks to a couple of very good splits, including a 1:09 for his last lap, he earned a PR by about twenty or so seconds! The fight for the fifth spot was a very close run between Andrew Cullins (Whitehaven) and Sam Baker (SBA). These two guys battled neck and neck most of the race and it ended up with Andrew taking fifth by about a half second. That half second by the way was about the difference in the splits each ran on their last lap. It goes to show just how important every step and every second makes a difference no matter the distance! A point to be made here is that this distance isn't run too often in the nation during cross country season, however Bradley's time happens to sit on top of the national mark for this event. It's early in the season, but it's still the top of the heap. Constatine, Davis and Tyler also rank 3rd, 4th and 5th respectively in this event as well. We'll have to see how this holds up, but bottom line, this was one fast race for all to see! There's also a very unique character added to this meet. No, it's not Elvis! This meet brings in a handful of Elite level athletes that come to showcase their talents and win some prize money. So yes, you enter this race and then stay and watch these athletes shoot for some very fast mile times. And by fast, I mean really fast! The Women's race was won by Shannon Osika in 4:25.47 and runner up was Kate Van Buskirk (4:29.24). Kate was last years winner and we all certainly are glad she came back to show us this race! The Men's race, well, let's just say when we talk fast, that would be a huge understatement. Eric Avila won it by 0.05 of a second with a 3:55.43. There were nine guys under the four-minute mile mark! I think just recently, the 50th anniversary of Roger Banisters sub 4-minute mile was celebrated. I can't even imagine a time where I thought that I'd be standing by the finish line to watch NINE ATHLETES running sub 4-minute miles in the same race! That was an unbelievable race to watch. Running a 3200M race at this stage of the cross country season and watching elite level athletes display their talents over the mile should be a good motivating drive to jump start your 2018 cross country season! See you on the Track... and the grass!